As we near the last 12 weeks of training, we are in some of the hardest training sessions we can be in. We are still building our training loads and hoping to increase performance metrics a little bit more before we start focussing on grooving our race pace and becoming efficient long course athletes. For that reason, the sessions will still be long with training focussed on building intensity through the workout. You will find you are also improving your endurance and short 'easy' sessions would be considered daft for most non-triathletes. In fact, many of the sessions will be equivalent of shorter distance triathlon legs as part of a normal training week! Don’t be fooled by the sessions beginning to feel like they are at an easy intensity. The ability to train at “race pace” will allow you to settle into it when you have excitements or nerves near the start of the bike ride (You will feel so energised!) and let you settle into the IRONMAN marathon run, which is never as fast as you believe you should be able to run. Grooving these paces and efforts allows you to not worry about pace or effort and rather focus on eating and staying on top of your own nutrition. Now is the time where we are focussing on improving your ability to be stronger in the second half than the first of any swim, ride or run. Time to head into the open water environment. You also have the chance now to start getting some open water swimming under your belt. Open water swimming should be considered with respect. 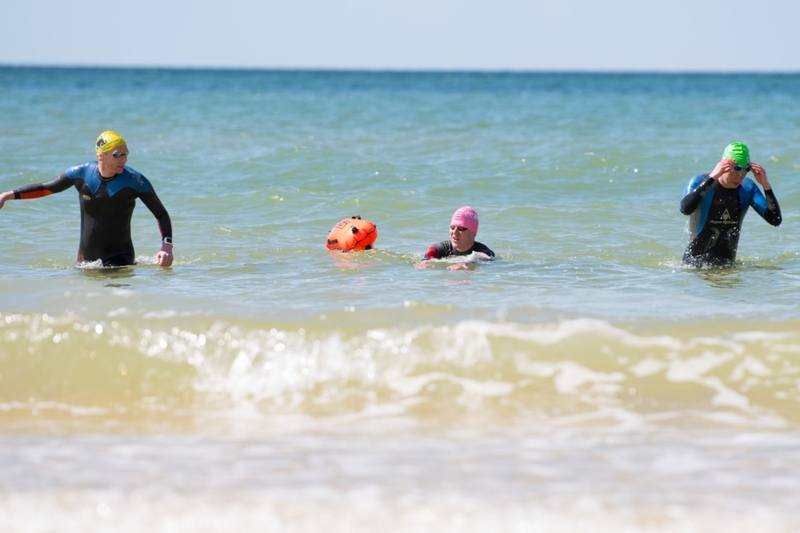 There are associated dangers as a result of swimming in an open water environment and these always need to be considered. However, in the same breath, you should also think that open water swimming is more or less the same as pool swimming just with fewer plasters floating ahead of you! Firstly, don't try and change anything from a mechanics point of view. Your training in the pool should transpose to swimming open water. All too often though the cold water and the new environment shortens the stroke and increases the stroke rate, so focus on doing what you do in the pool! Any slight modifications will happen naturally. For the most part, open water swims are not about training for extra fitness, rather they are about training for the environment. Early in the season, the water will feel cold and you will need to become accustomed to that. Also, you will need to get used to swimming with a wetsuit. This can place slight restrictions in arm mobility (making it feel tough) as well as help you swim faster as you have a better body position (positive outcome!). Finally, people can find open water swimming daunting or scary. We strongly suggest that if this describes you, get some open water sessions with a coach as they can really help you gain confidence in the environment and you will certainly gain top tips to help you get over your fears. For more advice on conquering the open water, check out this blog. In order to get the most out of your open water session, make sure there is a key purpose (like in your pool sessions). It may be you do some technical work one session, focus on varied pace work or speed on another week and aim to do long, continuous endurance sessions another one. But the sessions are never, just jump in and swim a bit – as far as you feel. Make sure you have a key purpose with the session. With the above suggestions, it will allow you to understand your rate of perceived exertion (RPE) at a variety of different efforts aside from just swimming and make you a stronger, all rounded, open water swimmer! In general though, this is your last big push – keep on doing what you are doing!